I have miles of respect for any Hudson Valley band with its sights set beyond the typical let’s-just-play-for-our-friends-and-some-free-beer rut. Nothing wrong that circuit, mind you, but to me it’s commendable when an act goes on the road and really works it. 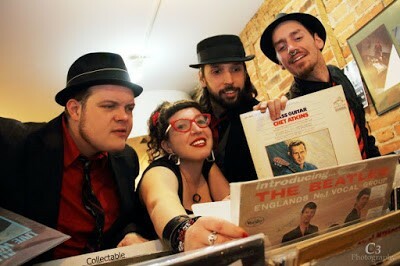 And local singer Lara Hope has certainly been working it over these last few years, with her past outfit, Lara Hope and the Champtones, as well as her current projects, the punk trio Tiger Piss and the rockabilly quartet Lara Hope and the Ark-Tones, all of which have toured widely. In fact, the latter group is celebrating its new self-released album, Luck Maker, with a show at the Anchor in Kingston next week. Funded by supportive fans via an Indiegogo campaign last winter, Luck Maker was laid down at Woodstock’s famed Dreamland Recording Studio. Special guest players on the album include cellist Jane Scarpantoni (Lou Reed, R.E.M. ), guitarist Grasshopper (Mercury Rev), and others. Lara Hope and the Ark-Tones will headline the Luck Maker record release party at the Anchor in Kingston on June 14 at 9:30pm. Also appearing are Pitchfork Militia and the Jack Grace Band. Admission is $7. For more information, call (845) 853-8124 or visit www.TheAnchorKingston.com.